Bill Murphy: Is Grunge Still A Graphic Design Style? The quick answer is of course, yes. We can apply all kinds of styles depending on the need, target market, and/or message we want to convey. Looking deeper we may find as new mainstream styles come and go, grunge may follow the same trend. It was arguably at its peak, with huge popularity in the 1990’s. Still hanging on today I feel it is more of a designers taste and depends on many factors. I even feel that it may be coming back a little bit in a odd dressed up grunge. Here is an example. Think a fancy suit company that may never have used this style in there marketing. They now have an ad with a grunge typeface including a man in his late 20’s wearing work boots and a fancy suit. The focus is to grab our attention, showing the slick high end suit and have it really stand out. I’m trying to get a term for this trend, possibly clean grunge. LOL. 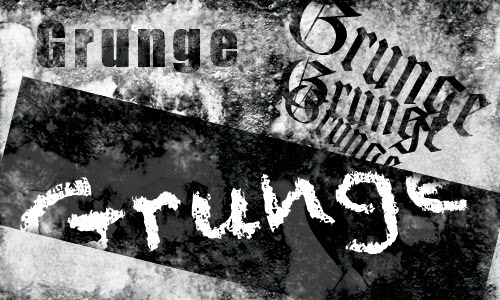 Here is a link to a good article on the history of grunge and some more details focusing on typography. I found it really informative. I like to try and find design trends and styles before they become big. I like to try and figure out what will be big in a few years. The animated vines and flowers were big for a while and still are around but not like they were say 5 or more years ago. These swirly bits, as I like to call the trend, is one of my favourites. Now it is more of a flat clean look that is trending. See my Flat vs Realism post. 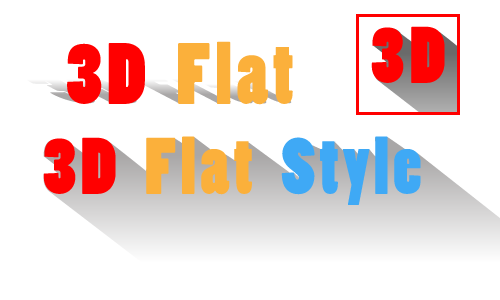 Flat is a definite trend that is being seen everywhere. It is even starting to change as designers are adding extended cast shadows making for a 3D flat style, if that makes any sense. See my graphic samples attached. As for grunge I think it is still fun and will be around for a bit longer. Grunge style is moving and changing as designers are still trying to be creative with it, like in the suit style ad mentioned above. I like grunge and made some t-shirts a while back that had a distress effect applied to them. I also made non-distressed, and censored versions. You can find them here. Not fully in the grunge style but the distressing and older style graphics makes them fall somewhere in the mix with a definite grunge influence. My personal thought is that I hope grunge stays around for a while longer. It will be interesting to watch it develop and change. Are you still using grunge in your work or personal projects? What do you think the next big trend will be? Leave some comments and let us know. Update: Recently I have been seeing lots of bubbles. Faded background bubbles or circles in marketing seems to be a new trend. If you have not noticed it, now that I mentioned it you will see it everywhere. Seems like less grunge and more bubbles.